I told my mom last week that I craved beef stew, but I’m not entirely sure she believed me. Why? This meal was on my “avoid” list as a kid. The only reason I started eating it was probably because it was easy to make in a slow cooker when I first started having to fend for myself in the kitchen. That was back in the days where I had to cook a pot roast for about 13 hours, 18 if the roast was big. Thankfully, I didn’t give up on using slow cookers, I just got a new one. Nowadays, even though I adore my Dutch oven, when it comes to beef stew, I’m faithful to my slow cooker. However, for this recipe, you’re still going to put in about an hour or so of prep before you can even think of letting your slow cooker do the work. Why? Because whatever you do, don’t skip the step of dredging the beef and browning it – unless, of course, you enjoy vegetables and chunks of beef in a bowl of chicken stock. As obvious as it sounds, I learned that lesson the hard way. Combine beef, wine, garlic, and bay leaves in a large plastic bag. Refrigerate overnight. The next morning, remove the beef with a slotted spoon, reserving 2 ½ cups marinade (discard garlic and bay leaves). Blot beef dry with a paper towel. Combine flour, salt, and pepper in shallow bowl. 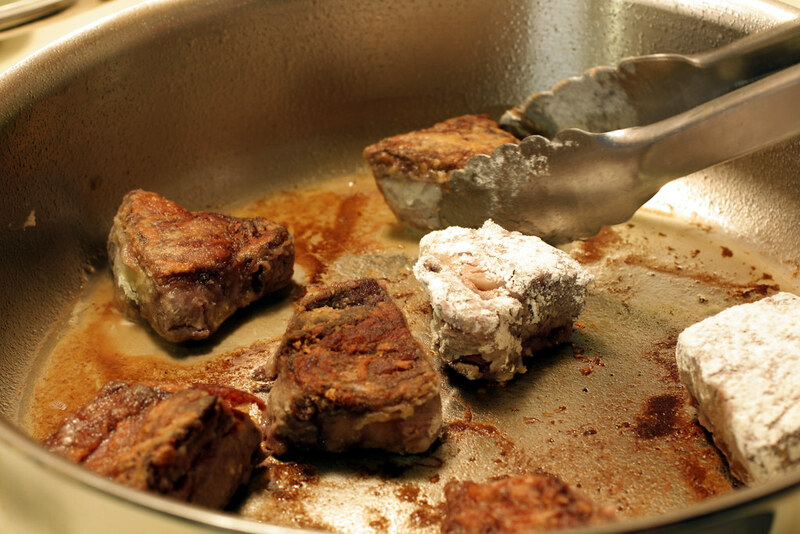 Dredge the beef cubes in flour and set on a plate. Heat 1 tablespoon olive oil in a large skillet over moderately high heat. Brown several cubes of beef at a time, making sure the cubes aren’t touching each other. 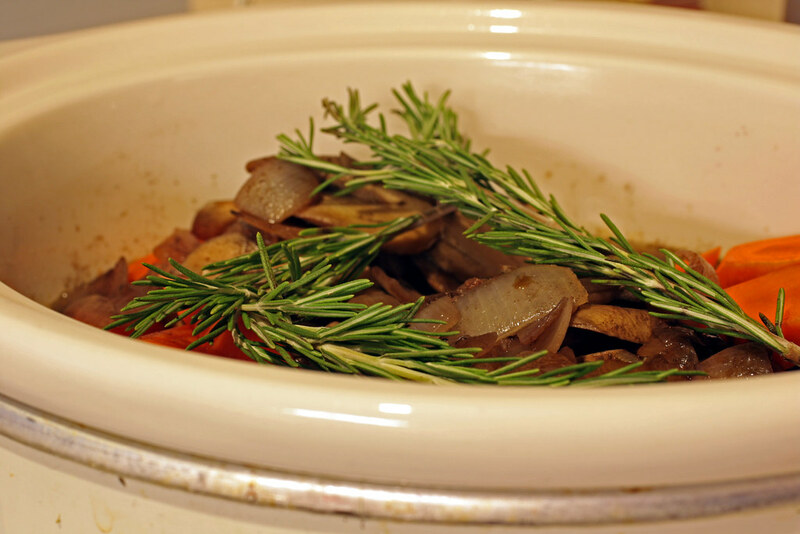 Add browned beef to slow cooker. 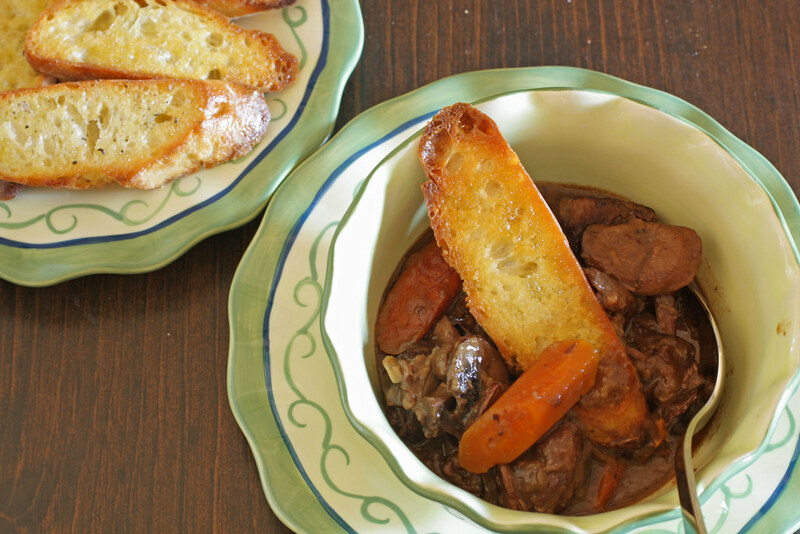 How long do you leave stew in slow cooker?